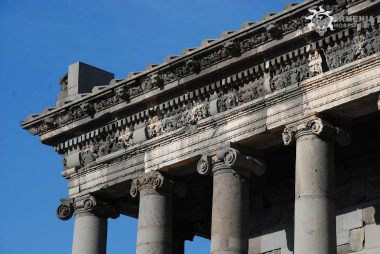 Day ½: Yerevan - City tour - Matendaran - History Museum. Note: 1st and 2nd day activities will be adjusted according to the itinerary of the group. City Tour around Yerevan - the capital of the Republic of Armenia. 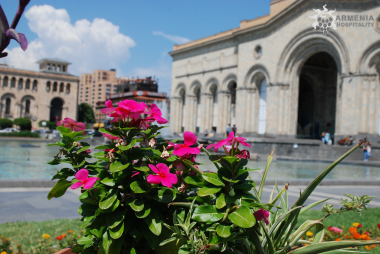 Having a history of almost 2800 years, Yerevan is a modern city with high rise buildings, nice cafes and parks. It’s a combination of reach history and a modern lifestyle. Yerevan City was originally designated so that it overlooked the biblical MountArarat, and indeed the Holy Mount can be seen from every corner of the capital. You will see all major sights of the capital including Opera house, Republic Square, Kievyan Bridge, Baghramyan Avenue, the Presidential Palace, Academy of Sciences, National Parliament as well as "Cat statue" by famous sculptor Fernando Botero at the Cascade area; enjoy the panoramic view of Yerevan etc. Visit Matenadaran (www.matenadaran.am) - is an ancient manuscript repository located in Yerevan, Armenia. It holds one of the world's richest depositories of medieval manuscripts and books. Day 3: Etchmiadzin - Zvartnots - Genocide Memorial - Yerevan. Breakfast at the hotel. Departure for Etchmiadzin town - the residence of the Supreme Catholicos of all Armenians and the center of the Armenian Apostolic Church. Etchmiadzin means “The Descent of the Only Begotten Son and is one of the ancient capitals of Armenia. 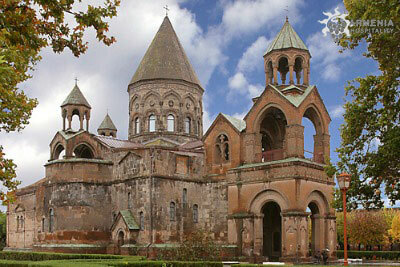 On the way we visit Saint Hripsime Church - one of the oldest surviving churches in Armenia. The church was erected in the year 395 AD. That contained the remains of the martyred Saint Hripsime to whom the church was dedicated. The structure was completed in the year 618 AD. It is known for its fine Armenian architecture of the classical period, which has influenced many other Armenian churches since. This church together with other nearby sites is a UNESCO World Heritage Site. Etchmiadzin Cathedral - the oldest state-built church in the world. According to the legend, Jesus Christ descended from heaven and indicated the spot for a church to be built. 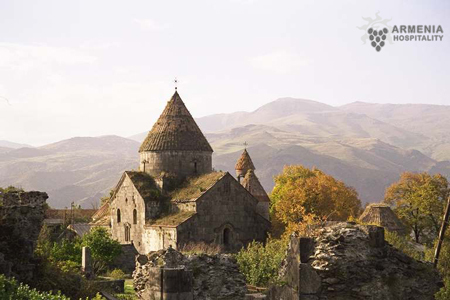 The construction of the church began in 301, the year when Armenia became the first state in the world to adopt Christianity as a state religion. Proceed to the Zvartnots temple. The architectural masterpiece of Zvartnots was built between the years 641 and 662. It was damaged by the earthquake in 10th century and unearthed nearly thousand years later in 1900-1907. Day 4: Yerevan - Sevan - Noraduz - Dilijan - Haghartsin. Breakfast at the hotel. Departure to Lake Sevan. 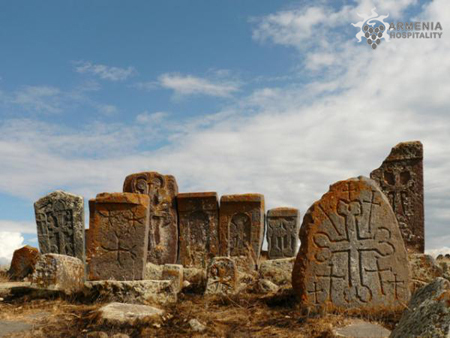 Visit Noraduz - the valley of khachkar (crossstone) and the ancient cemetery. It is the most original manifestation of Armenian medieval culture. This is a unique place, where one can reveal the development of cross-stones art in its historical process. Lake Sevan is the largest alpine high mountain freshwater lake in the Caucasus region and in Armenia Highland. It is impossible to imagine the island of Sevan (currently a peninsula) without the Sevan Monastery, a perfect example of a manmade testimony of faith complementing the surrounding divine nature. According to the historical records, the Monastery was built in 874. Lunch. Continue to the resort town of Dilijan with beautiful scenery of mountains covered with thick forests. Haghartsin - the monastic complex among the picturesque fortress, near the town of Dilijan includes three churches, two gavits (one in ruins), a refectory, a group of chapels and several khachkars. The principal church Sourb Astvatsatin was built in 1281 as a cupola structure with a tall drum. This combination of natural and architectural beauty is very impressive. Return to Dilijan and overnight. Day 5: Dilijan - Akhtala - Hakhpat - Sanahin - Yerevan. Breakfast. Drive to Alaverdy town and then to the Fortress and Monastery of Akhtala - located on a high plateau. Archeological excavations has shown that the area has been occupied by human since the early Bronze Age. The half-ruined fortress of Akhtala is more than 1000 years old. The fortress was built during the reign of the Kurikian branch of the Bagratuni dynasty. The main church of the Monastery of Akhtala, St. Astvatsatsin (Mother of God), was built by Amirspasalar Ivan Zakarian Yerkarabazouk early in the 13th century. The church is famous for its first-rate and highly artistic frescos, covering the interior walls, partitions, and bearings. They are characterized by perfect iconography, richness of themes and diversity of colors. During autumn period a lot of interesting festivals such as the chef competition, national games and wine tasting take place in Akhtala. Lunch. Proceed to the Monastic complexes (10th c) of Hakhpat and Sanahin - included in the UNESCO World Heritage List. These magnificent samples of Armenian architecture represent a unique building between domestic Caucasian architecture and the evolved Byzantine style is located on the picturesque canyon of Debet River. The monastery is an outstanding and magnificent example of medieval Armenian architecture that has been attracting increasing numbers of tourists. Return to Yerevan and overnight. Day 6: Yerevan - Khor-Virap - Areni wine factory - Noravank - Yerevan. Breakfast at the hotel. Departure to Khor Virap, which is translated into Armenian as a Deep Pit. Here in the deep pit St.Gregory the Illuminator was kept imprisoned for 13 years. But after curing the king from a grave malady he was set free and persuaded the kind to adopt Christianity as a state religion (301A.D.). It is situated in the Ararat valley against the Biblical Mount Ararat, were Noah's arch cast anchor. 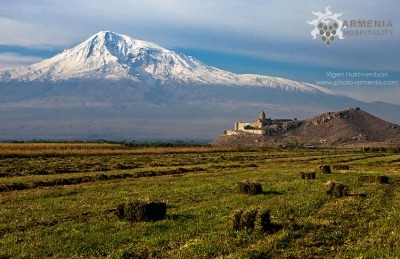 You will have a great opportunity to take pictures and enjoy unrepeatable view of Mount Ararat. Continue to the monastery complex of Noravank (5-13th cc), erected on a breathtaking site, on brick-red cliffs of Amaghu canyon. It has reach decoration both in internal and in external parts. On your way to Noravank your will see beautiful colorful mountains and landscapes. Day 7: Yerevan - Garni - Geghard - Yerevan. Lunch. Visit the museum & monument in honor of the victims of the 1915 Genocide of Armenians. Visit Armenian Wine/Brandy factory - optional (10E per person). Vernisage open-air handicraft market where you can buy souvenirs in remembrance of your trip to Armenia - only on Saturdays and Sundays. In the evening-Farewell party dinner at traditional Armenian restaurant with live music and performance. Overnight in Yerevan.